The best place to keep up-to-date! 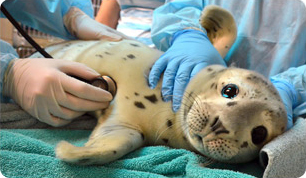 In the Newsroom you will find links to Press Coverage about the work of The Marine Mammal Center, some of our Latest News happening right here, and our Social Media pages. Check back often to keep up-to-date on the latest news about our patients, research, rescues and more! Go to our Media Center to find media materials such as press releases, fact sheets, logos, spokespeople bios and a historic timeline. You can also request speakers at your event via our Speakers Bureau section also located in the Media Center.